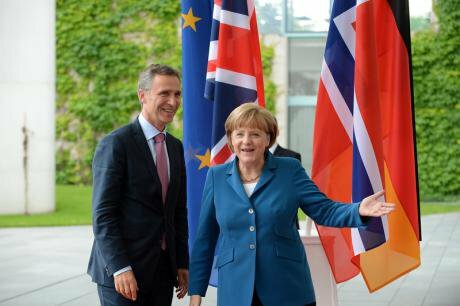 Angela Merkel receives Stoltenberg and Cameron for talks on the Euro, 2012. Demotix/ Goncalo Silva. All rights reserved.Britain’s influence in Europe, and even its membership of the European Union, are now the subject of robust argument in the country. There are divergent views on the best ways forward. This contribution is not intended to take part in the British debate, but is a perspective on the larger issues guided by my judgment of what serves Norway best, and what I believe will serve Europe best. Quite possibly, Norway’s longest-standing and most consistent foreign policy tradition is not to part ways with the British. It stems from the Napoleonic wars and the famine caused by the British blockade of Denmark-Norway. This was a harsh lesson, but we have since been well served by our close ties to the UK and benefit from its influence in Europe and beyond. We believe our interests are still served by being closely aligned with Britain, and by Britain being inside the EU. In the diary of his years as President Kennedy’s ambassador to India, eminent economist John Kenneth Galbraith mentioned a brief meeting in the White House. The president asked Galbraith to prepare a memo on what relations the United States should seek with "the sixes and the sevens" - the informal names often used at the time for the European Economic Comminity (EEC, or "Common Market") and the European Free Trade Association (EFTA). Three points strike me about the fact that this actually happened. First, there used to be a time when EFTA had more members than the proto-EU (and among them, the UK!). Second, there was a time when the president of the United States discussed EFTA with his closest advisers. And third: that was quite a while ago. Norway and Britain's European paths split when the UK joined the then European Community in 1973, while Norway has remained part of EFTA, and since 1994, the European Economic Area agreement (EEA). But in several ways, we are no less integrated. Norway’s trade with EU countries accounts for a greater share of our foreign trade than of Britain’s alone. In relative terms we have more EU labour immigrants than does the UK. We are part of the Schengen system. We implement more than three-quarters of EU legislation. We regularly align ourselves with EU positions on foreign and security policy. And our financial contributions are on par with comparable EU member-states. Essentially, with the exception of our agricultural policies, Norway is part of the same European integration process as the UK. What really sets Norway apart is that we don’t have the right to vote in Europe. The EEA agreement entails systematically accepting EU legislation, while being also firmly anchored in our national democratic process. It is vital to Norway. Without the access the EEA agreement gives us to our largest market, our economy would suffer. The free movement of people has been particularly important. Among EU member-states, only Luxembourg has a higher proportion of EU labour immigrants. I have visited many rural communities in Norway where local businesses tell me the same story: they cannot survive without skilled workers from Europe. No one falls in love with a market, Jacques Delors once said. Well, at least Norway is pleased to be lawfully joined to the single market, whether love is involved or not. It is crucial for Norway’s economy, for our companies, our jobs and our welfare. And the EEA agreement is our lifeline to this market. During the past twenty years we have incorporated more than 10,000 EU rules into the EEA agreement. That means roughly five acts of EU legislation for each day the Norwegian parliament has been sitting. We see the results of these rules every day - in our daily lives, in our work, in our public sector and in business. They have brought about a profound Europeanisation of Norwegian society. However, we have had little direct influence over these rules. Yes, the EEA agreement requires that Norway, and our partners Liechtenstein and Iceland should be consulted in the early stages of EU decision-making. But we are merely consulted. The EU is under no obligation to listen. We have to work hard to make our voice heard. We do. That’s why as a non-EU member we have a minister for EU affairs. But honestly, I have a hard time seeing the UK, with its global ambition, dedication and contributions, being comfortable with such an arrangement. I say this not out of fear for a return of the UK to EFTA - although that would alter Norway’s relative position within the EFTA/EEA. After all, we are the great power in the Oslo–Reykjavik–Vaduz axis. While the EEA agreement is important to Norway, other matters are even more important. And while issues like immigration, access to benefits, and EU red tape are important to the UK, I believe other matters are far more important and should be placed at the heart of the debate. Europe is a different place today than when the idea of a UK referendum was launched. Above all, Europe is a more dangerous place today than only a year ago. We are experiencing the most serious security situation in Europe since the second world war. Russia has annexed another country’s territory and is using military force to destabilise its neighbour. This is a form of power politics that belongs in the past and must not be allowed to succeed in Europe. As an outsider, Norway has aligned itself with the EU’s restrictive measures. We have done so because there must be a reaction to Russia’s unacceptable and flagrant breach of international law. It is vital that Europe and the transatlantic community have been united in their response to Russia’s conduct. NATO has confirmed its crucial role, combining deterrence with reassurance. But the predominant response has not been and should not be military. In this situation we have seen the EU, long known for its lack of teeth in foreign policy, acting with remarkable resolve. The situation is very different from the Cold War. Then, NATO was the only organisation that really mattered. It still does, and more so than only a year ago. But today, the continuous deliberations on and calibration of European policy towards Russia and Ukraine are primarily taking place within an EU framework. In 2014 there were three meetings of NATO foreign ministers, and some twenty of EU foreign ministers. For all its flaws, and the EU has many flaws, never has the role of the EU in an international crisis been more important. Never have the consequences of EU leadership been more significant. For most European NATO members, this development might not raise eyebrows, since they are also EU members. For Norway however it is a dramatic development that we are not at the table when policies so critical to our security are determined. And I believe it would be a major issue for Britain if the country were to leave the EU. I cannot really imagine the UK not being part of key discussions that matter for Europe’s security. Moreover, it is evident that without Britain in the EU, Europe will be far less effective and forceful in foreign relations, security and defence policy. This is serious indeed in relation to a more assertive and aggressive Russia. And looking at Europe’s other neighbouring areas, it is equally important that the EU is strong, coordinated and comprehensive in its approach. We need to strengthen external and internal security at the same time. We need to fight terrorism but also to prevent violent radicalisation both abroad and at home. We need to support sustainable stability and democratic rights in the Middle East and north Africa, not the kind of repressive stability that has failed miserably in the past. We need to manage migration and support economic and social development in the regions of origin. Britain’s influence and resources are crucial for the future development of the EU’s foreign, development, security and defence policies. In order to deal with today’s security challenges, both Europe and the EU need to be stronger. This is the view not only from Oslo, but from Washington. NATO will also be stronger if the EU is stronger. And the EU will not be stronger without Britain. A stronger Europe requires a more competitive economy. With Europe’s diminishing competitiveness globally in recent years, there is a need for actors like Britain to push for economic reform inside the EU. And it is vital that a strong economy, like Britain’s, remains in the EU. The single market is largely Britain's achievement, and it will both widen and deepen in the coming years. New growth opportunities will emerge, like the digital single market. New rules will be developed. I believe opportunities will be greater and regulations will be more sensible if the UK takes part in shaping them. On 25 February, the European Commission launched its Energy Union strategy. Norway wants to play its part in strengthening Europe’s energy security and climate security. Our natural gas as well as our hydropower make Norway part of the solution. We want to continue to work closely with the EU in shaping Europe’s green competitiveness, and we believe the UK has a leadership role. The next few years will hopefully see the conclusion of the Transatlantic Trade and Investment Partnership (TTIP). It could be a game changer for the transatlantic area not only economically but also strategically. It could set standards that would become global. In these negotiations the US and the EU are partners of fairly equal strength. This would not be the case if a single European country - even a large one - were to negotiate such a treaty with the US. On the other hand, a TTIP without Britain on board would lose crucial impact and effectiveness. Europe is facing fierce global competition. We need to understand what is at stake for Europe, and act accordingly. Britain is Europe’s only truly global nation, with unrivalled global experience and a distinctly global outlook. Britain has one of the world’s most diversified workforces, with human resources from most corners of the globe. These are strengths in today’s global and competitive world, and they are strengths that are much needed in shaping a globally competitive Europe. In conclusion, I do not think the EEA/EFTA model is an adequate alternative for Britain. But the real issue is not future models of European integration. The real issue is the future of Europe: its security, prosperity, welfare, and fundamentally, Europe's values. Europe is under pressure, in several ways. From the global power shift and global competition; from fragile states, conflict and terrorism to the south; from military assertiveness and zero-sum thinking to the east; and from political extremism within. In mid-February, President Putin visited Hungary, a member of the EU. Officially the visit was to mark the seventieth anniversary of the end of the second world war. But in Budapest he also chose to honour the memory of Soviet soldiers who took part in the 1956 intervention to - in the words inscribed on the memorial - "fight counterrevolutionary forces" behind the popular uprising of that year. It is a source of deep concern that various political forces in Europe are voicing support or understanding for Putin’s policies and actions, while at the same time wanting to undermine European values, European integration and the EU. When we make choices about the future of Europe, it is worth considering what political forces will see themselves served by a weaker Europe and a weaker EU. British leadership is needed to help Europe counter such forces and emerge stronger, more free and more prosperous.